EPISODE 10 Can I ever learn to put myself first? In this Thursday Therapy episode, Glenn Mackintosh helps you understand you CAN learn to put yourself first, shows you how to deal with the “growing pains” of prioritising yourself, and helps you focus on yourself without being selfish. The answer to your question Margaret and I’m sure you are not alone, is absolutely yes. I wouldn’t be a psychologist if people couldn’t learn to prioritize themselves more because the reality is whether you want to learn exercise more or whether you want to change jobs from a job you hate into a job you love or whether you want to boost your self-esteem, any type of change you want to make, it requires you to focus on yourself and make yourself a priority for it to practically work. So, I’d encourage you to think really practically about it, you probably need to do this, you know I agree with all the warm and fuzzies that you’re probably worthwhile as a person and you deserve it and I agree with that understanding that probably if you take better care of yourself you’ll be better able to take care of everyone else, that’s probably all true, but I’d encourage you to think really practically; to make a change happen you need to focus on yourself, it just has to be done for it to work but the good news is absolutely, yes, it can be done. Now that doesn’t mean that it’s going to be easy, especially in the weight management area where so love this idea that everything should be easy, but I want to sell you the reality that it’s actually going to be quite hard. Now that’s okay because all it means is you got to make room for some uncomfortable feelings and thank goodness feelings come and go they don’t last forever, they’re only feelings and I’m going to provide you with a link to my blog called “Growing Pains” where I can help you to make room for those growing pains, those uncomfortable feelings that you put yourself in place of, you make yourself go through those feelings in service of something that’s important to you. Now just because you’re going to feel uncomfortable when you’re taking better care of yourself it doesn’t mean those feelings aren’t necessarily justified, so I’m going to talk you through that. So, let me talk you through this idea of becoming more self-nurturing. If you imagine that there’s a continuum and on one side of the continuum is being completely selfless, I see people more often than not that are up at this end of the continuum and in this end you’re taking care of your work before yourself, you’re taking care of the family before yourself, you might even be taking care of your neighbour’s dog before yourself, just everyone comes first before you and then of course on the other end you’ve got selfish, that’s you know stuff the family, stuff work, I’m just going to do whatever I want and take the best care of myself. Because I’m often working with people on this side and I’m imagining that you might be one of these people, when you make any direction change towards being self-nurturing or self-caring, that place where you can look after yourself and others, in a way that works for everyone, it’s a nice balanced space and because that’s not familiar to you, you can feel like you’re jumping all the way over to being selfish, you can feel guilty or you can feel like you’re not being the type of mother that you should be or you’re not being the type of staff member that you should be and of course other people can kind of, you know, agree that that’s the case because it’s not normal for them for you to move there too. So, what I want you to do, because of course I’m going to be encouraging you to become more self-nurturing, I don’t want you to be selfish then you could be really fit and really healthy and then you’ve got no friends anymore, I want you to just move in this direction and naturally I want you to make room for the growing pains that come with moving towards a more self-nurturing space, remember that’s a space where you can take care of you and others, that nice middle ground, but when you do let’s sort of insert a bit of rationality. I want you to ask yourself when you’re making these decisions. say if you’re you know taking the time for yourself to exercise or whether you’re preparing one meal for the family rather than three meals because that works a bit better for you or whatever that choice is for you, I want you to ask yourself, “Is this selfish? Or is it just self-caring?” If you decide that selfish, then probably don’t do it but if you decide that it’s self-caring then that would be a really good thing to do. So, I want you to practice that, make room for the growing pains, if you can’t decide you might ask yourself, “Well what would a friend tell me if one of my best mates who really knew me and knew the whole situation would encourage me to do this?” Then maybe do it or the other way you can think about it is, if a friend were in this situation moving towards this behaviour would I encourage them to do it what I say no that’s actually really selfish you shouldn’t do that or they say yeah, you know, what you need to do is value yourself enough to do that. So, what I want you to do is practice this between now and next Thursday Therapy and let’s set us all a challenge. 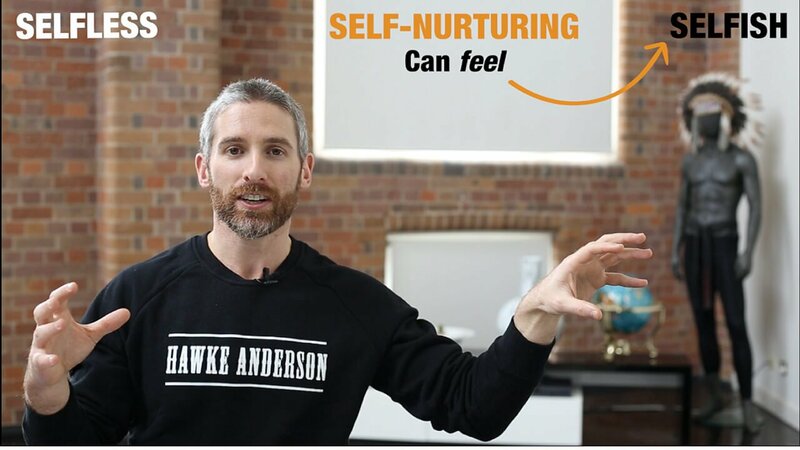 I want you to do one self-nurturing thing and comment below, in whatever form you’re watching this video, comment below with what your experience is like; was it really easy? was it really hard? was it surprisingly comfortable? was it really didn’t all go pear-shaped and what can you learn from that? Just whatever your experience is with becoming more self-nurturing. Guys, quick shout out before we finish, I’m wearing a Hawke Anderson shirt. Dan Jokovich and his team at Hawke Anderson they do fantastic work in digital media. They created our website, they’ve done the intro that you see every Thursday Therapy, they even showed us how to do the video work that we do with you in every Thursday Therapy and honestly, I cannot speak more highly of them. I recommend them, they work in the fitness, the food and the health space, obviously I know a lot of people in that space, and whenever I recommend them everyone has the same experience as me, they’re just wonderful to work with so couldn’t recommend them highly enough and whatever format you’re watching this video on we’ll put the link to Hawk Anderson, so if you need anything done in that digital space, definitely go and see Dan and the team. The other thing is as always, please share this. We are trying to incorporate some really powerful psychological ideas to help people through their eating activity weight and body issues, so if you know someone that could take better care of themselves or maybe you’ve decided I’m going to take better care of myself, you can show people around you this video so you can say this is what I’m doing. It’s no offense to you, we’ve just got to all figure out a new way of doing things and until I see you on next Thursday Therapy, have a very self-nurturing, self-caring and self-loving time. Hey Buddy!, I found this information for you: "EPISODE 10 Can I ever learn to put myself first?". Here is the website link: https://www.weightmanagementpsychology.com.au/episode-10/. Thank you.